Completely restored 1960s set of six midcentury dining chairs, reupholstered in mustard fabric and finished with a beautiful provincial color finish. Chairs are very sturdy and ready to be enjoyed in any home for years to come. Measures: Seat height 19?, seat depth 16?. Milo Baughman set of six dining chairs with brass Plated Legs and seat with Original Ivory Velveteen Button Tufted Upholstery. 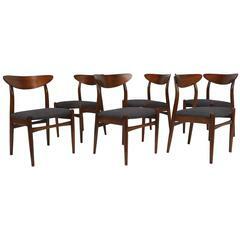 A set of six midcentury rosewood dining chairs. Beautiful rosewood chairs with black vinyl upholstery. Danish, circa 1960 Measures: 80 cm H, 49 cm W, 43 cm D.
Børge Mogensen set of six dining chairs in Oak and natural tanned leather. Two chairs with armrests. Executed by Fredericia Furniture. Four red Midcentury Jørgen Bækmark chairs made for FDB from late 1950s-early 1960s.